The World Trade Organization (WTO) held its fifth public forum in Geneva over three days beginning September 15. It has become a kind of international bazaar in which every conceivable idea on trade and development is discussed formally and informally by representatives of virtually every government in the world and more Non-Governmental Organizations (NGOs) than can be easily counted. A great deal of talk takes place without too much follow-up action. But, maybe that’s the point. People who talk to each other aren’t warring, so long may the talk continue. That’s not to say that good ideas don’t emerge from this overcrowded market place. They do. But many perish shortly after they are unveiled, usually because representatives of a powerful government or group of governments regard them as a threat to their interest, and quickly kill them off. I was in Geneva for a Writers’ Conference on a book on negotiations in the WTO for which I am contributing a chapter. All the writers are from what used to be called the “third world,” a description seldom used these days, not because we have miraculously graduated into some better world, but because other descriptions suit the agenda of those who dictate the form of discourse on the global economy. Far better, in their view, to describe poor countries as “emerging” or “developing” whether or not they are really emerging or developing. The purpose of the book, which has been commissioned by a progressive organization called CUTS International, is to tell the story of the many aspects of WTO negotiations from the point of view of negotiators from developing countries. When it is published, it should make fascinating reading. It will break new ground in presenting the personal knowledge and experiences of the writers who were either in the trenches of the negotiations or were marginalized from the “inner sanctum” in which only the rich and powerful nations enjoy belonger’s rights, and into which they invite only those they wish to suborn in order to stich-up deals. Of the many features of the WTO which point to the need for reform, this insider trading - in what has come to be called ‘the green room’ - is among the worst. No democratically managed organization should continue a process which so blatantly excludes from decision-making the weak, poor, small, and vulnerable nations which – as it happens – make up the majority of world’s countries. That it has continued so long is entirely the fault of the majority of governments who allow it to happen without tangible and meaningful protest, such as packing their bags and going home leaving the ‘green room’ insiders to deal only with themselves, and returning only when there is a table at which representatives of all parties sit as equals. But, that would call for two things – courage and solidarity, two very scarce commodities among “third world” governments these days. National interests have changed, some argue, and in pursuing these interests following a “third world” strategy is not productive. It is worth, noting, however, that a “developed countries” strategy has never altered. The world’s industrialized nations continue to cling to their councils and to exploit their advantages. For instance, the creation of the G20 (the industrialized nations and the larger and wealthier developed countries) has not overshadowed - let alone eliminated - the G7 (the industrialized nations alone) who continue to devise and coordinate their own global positions. 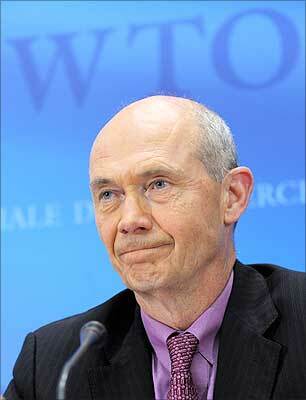 Against this background, I was surprised to hear Pascal Lamy, the Director-General of the WTO, say at the opening of this year’s Public Forum, almost boastfully, that while the G20 has signalled the requirement for institutional reform of some international organizations, “the WTO was not amongst them”. I have no doubt that Lamy believes what he says, but his belief – however sincere and fervent – does not make his statement right. The governance of the WTO is still an open sore. Despite Lamy’s personal efforts, the organisation still reflects the preponderance of power by the industrialised nations and the marginalization of poor, small, and vulnerable countries. “No board, no quotas. One member, one vote, is the background rule against which the WTO forges its consensus”, Lamy declared. Oh, were that to be entirely true, what a far better world would mankind inhabit than the one we endure today. Sure, there is technically no board and no quotas, but every representative of a small or poor nation knows that decision making is still the preserve of a few nations whose economic power allows them to arrogate to themselves the right to dictate agendas and outcomes. The WTO is very far from the consensus decision-making body that it should be. It is still not yet even the “fairly democratic institution” that Lamy believes it to be. Those who defend the ‘green room’ process do so on the basis that it is impossible to negotiate agreements with over 150 countries at the same table. There is truth in that. But it is equally true that representatives of like-minded groups of these countries can gather on sectorial issues that are important to them such as agriculture or services. This way their voices will be heard during the debate and account taken over their views. Against this background, it is good for developing countries - and small and vulnerable countries in particular - that the Bahamas is now negotiating the terms of its accession to full membership of the WTO. No country can now afford to stay out of an organisation whose rules govern world trade, and every country should want a say in the rules of the game it has to play. Bahamas will strengthen the voice of small and vulnerable countries, who if they act with courage and in solidarity with themselves and other like-minded developing nations, can negotiate meaningful recognition and fair and flexible treatment for their people – in other words, try to make the WTO truly democratic.